The juxtaposed tender, crunchy and chewy textures as well as the tart and sweet flavors make this a tasty green salad. Remove the tough stems from the leaves of kale and stack the leaves up. Roll the leaves and then use a sharp knife to shred it into thin strips. Put the shredded kale in cold water and soak for a few minutes before draining and spinning it in a salad spinner. 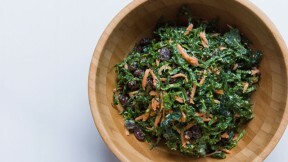 Put the kale in a bowl with the shredded carrot and raisins. To make the dressing, whisk the vegan mayo, lemon juice, caraway seeds and salt together. Pour over the kale and toss to coat evenly.